For a very strange reason, I had to put in a lot of work in order to watch this episode. After deciding to use my 13-hour flight to catch up on my (severely) backlogged work, the outlet for my seat decided to act wonky for the first 10min and randomly stopped working. The problem was that I didn't notice it and my (weak) battery gave out twice, leading to some pretty annoying insta-sleeps. Thankfully, this episode was surprisingly good, so I'd say it was worth it to deal with the plug. Despite this episode having come out quite some time ago, I didn't know anything about it until I began watching it today. It started off slightly mundane, with the premise of a wedding photo shoot for a magazine that featured Azusa, Makoto and Miki, but it suddenly picked up. 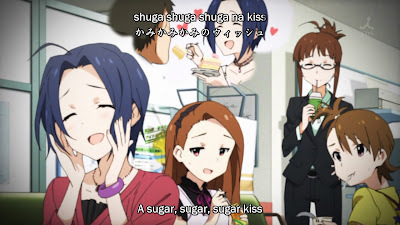 By the end of the episode, Azusa had gotten herself and Ryuuguu Komachi a lot more exposure, with both Makoto and Miki also receiving some of the accolades. Surprisingly, considering I hadn't expected to like the "simple-minded" Azusa, I absolutely adored her character after this 24min episode. 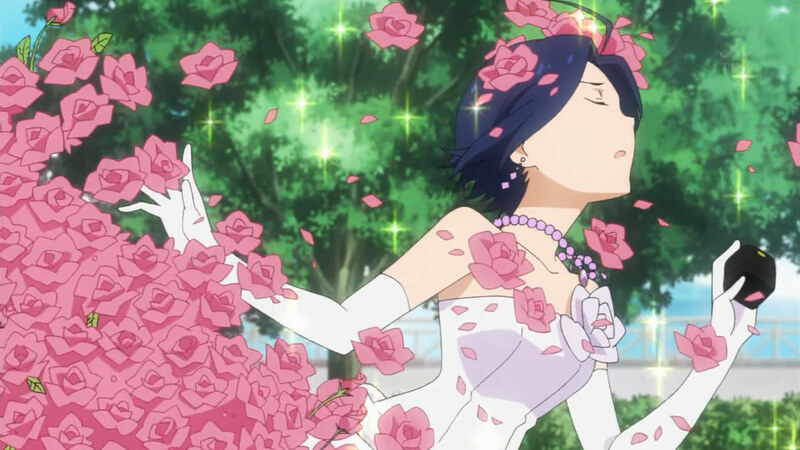 The first scene set up the story, with everyone commenting that Azusa looked great in her wedding dress. She wore a more traditional one, while Miki wore a much shorter one (perhaps more "contemporary"?). 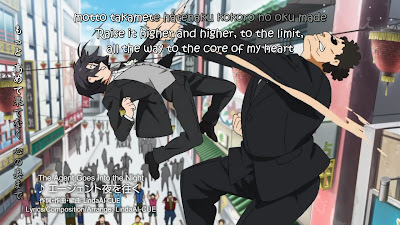 Interestingly, Makoto was stuck in a tuxedo as the "groom", mostly because the magazine wanted a man from the agency and she was the best match. Azusa decided to play around with her newly-mentioned friend, Tomomi, by sending a picture of herself in her wedding dress. This scene also pressed the idea that Azusa's life hadn't been going exactly the way she had planned (as a child, I assume); she had expected that she would be married by her current age. It's interesting how well-suited she seems to be an "attraction", considering how she has very traditional dreams of getting married. Some very disturbing faces, meant to highlight Azusa's beauty more? I wonder if a "soft computer" is better than a "hard computer". It didn't take very long for the "thugs" to figure out that Azusa wasn't the one they wanted, considering just how different the two women looked (also, they had a photograph of the red-haired woman), and they kicked her out of the car right away. She revealed another one of her traits - getting lost very easily - as she wandered around, attempting to figure out what to do next. Meanwhile, the goons eventually found the real bride, who was less than amused about getting married to the unknown groom. 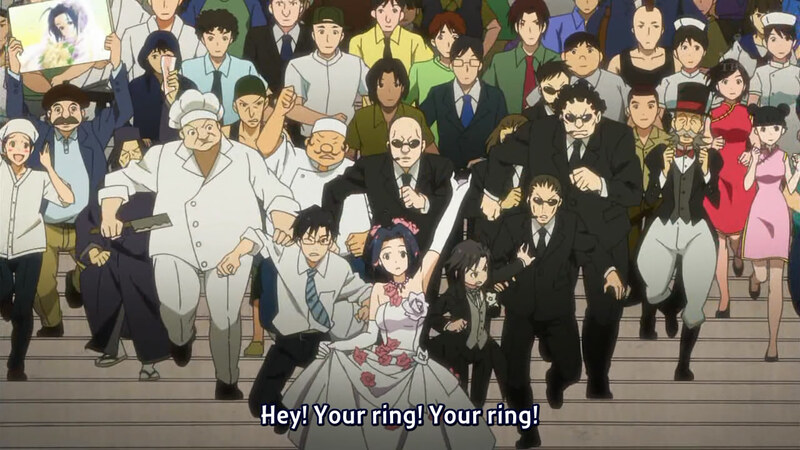 When pressed to return the heirloom ring to break the wedding, all parties realized that the ring was with Azusa, and thus the thugs returned to chasing the idol. How is that not putting yourself in mortal danger?! While all that was happening, Makoto ran desperately down the street with Producer haphazardly following. 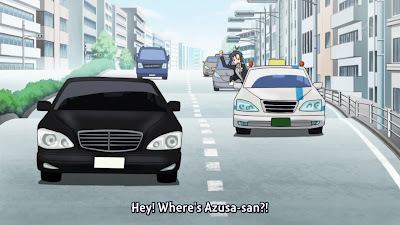 Upon getting a glimpse of the limo, she somehow randomly knew right away that that was the car that Azusa had been taken away in, and the two attempted to chase them in a taxi. This premise of how Makoto earnestly tries to get Azusa back continued throughout the episode, as well as Producer's general uselessness. Seriously, he did nothing worthwhile throughout the entire day. I thought he was trying to be a better producer - or, at the very least, a little more proactive. 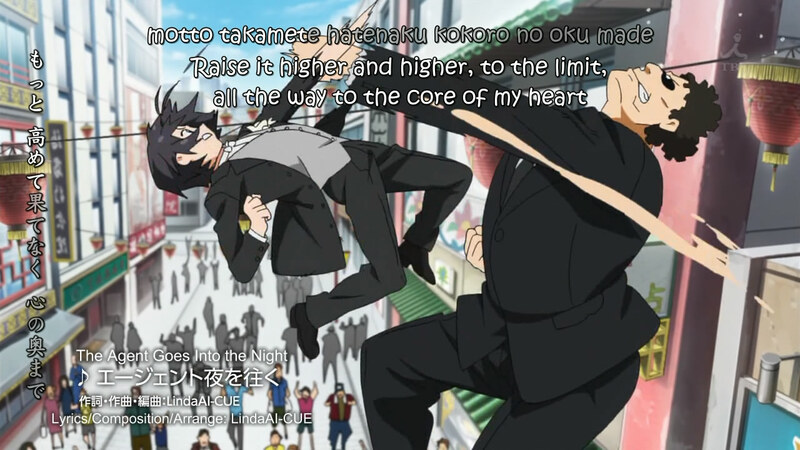 However, he spent the entire episode following Makoto's lead. Sigh. Miki's roles are still generally just to look good. Young children, so naive and trusting. As Azusa finally got the idea of getting a taxi, after wandering through the streets, her good-natured heart had her stop to help an old woman. Of course, the two got lost - but all was well, as the woman's adult son showed up and thanked Azusa for helping her mother. However, as soon as she was free again to hail a cab, some crying children showed up, tugging her dress and obviously asking for help. 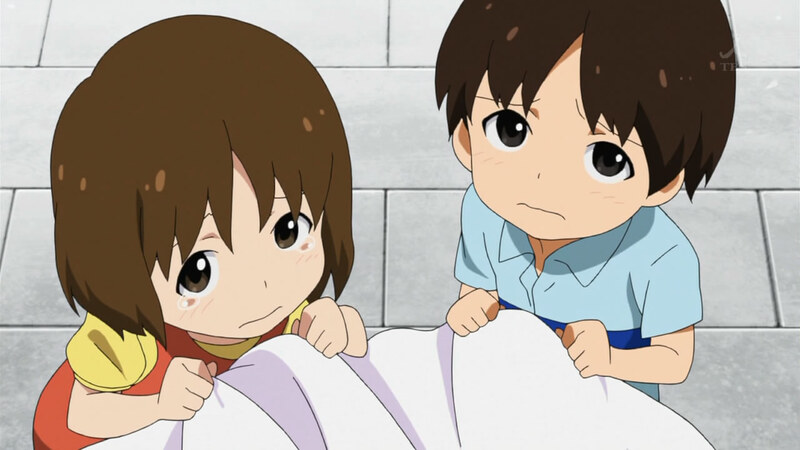 So, Azusa was next found walking through a shopping/food neighbourhood, attempting to find the children's mother. I found it curious that the children even asked for a meat bun; Azusa is a complete stranger. That's pretty impudent... Eventually, the children's mother showed up, though not after Azusa had created huge interest in the meat bun stall (due to the severe attraction that apparently both men and women had with her). 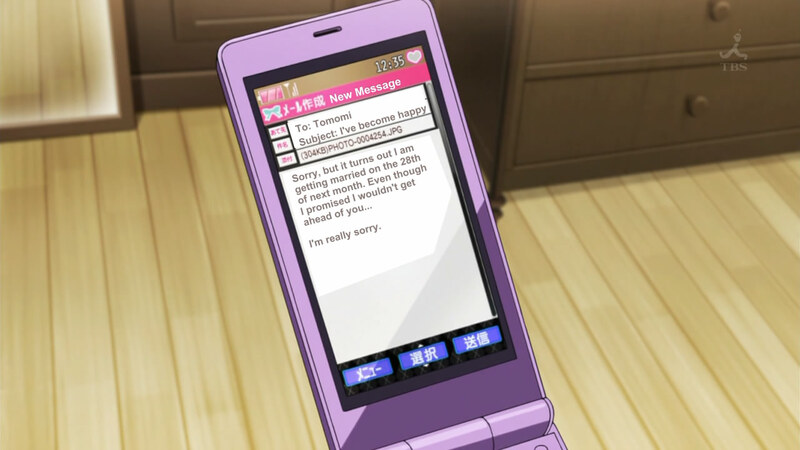 Even up until this point, I had thought that the episode was milking Azusa's specialness a little too much. I mean, she made crying babies happy again? Seriously? However, as her insert song continued playing, I began to like her more little by little. I still thought her charms were a little overdone, but I did begin to like her as a whole. She coincidentally ended up at a divination stall on an overpass, where the stall-owner was having stomach problems and roped her into watching his stall while he ran off. "Coincidentally", a white-suited man showed up to get some advice, as his bride had ditched him and he wanted to leave the country with a good memory. Being a foreigner, he was drawn like a very old-school shoujo hero. 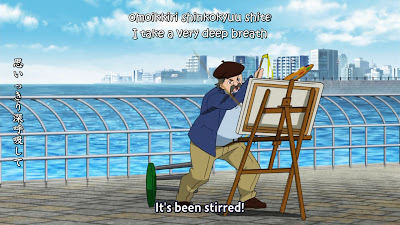 What's with that trend, after that dojo master from Nichijou? It's like The Matrix...or Chinese movies with cheesy/over-the-top martial arts. Everything came together as Azusa finally spotted the red-haired girl (acting with the thugs to look for Azusa and the ring), whom she began running after (as they hadn't heard her cries). 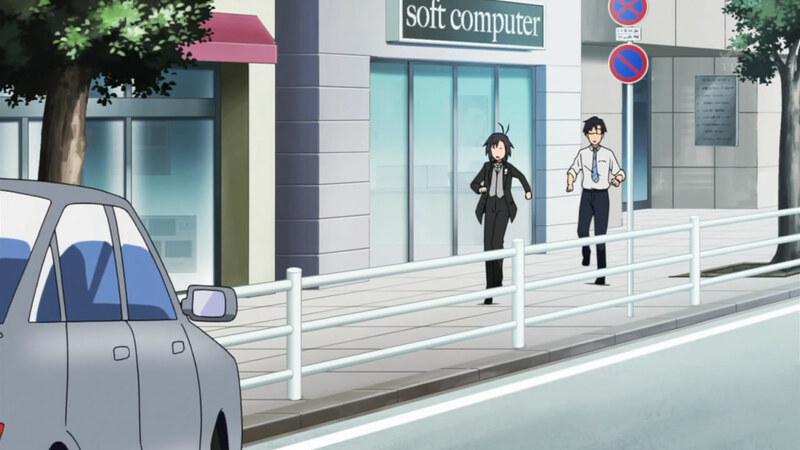 At the same time, Makoto found Azusa and ran after her, with Producer running after Makoto. Behind them was a random group of people, all chasing them for various reasons (many store-owners to get reparations from Producer, the other thugs to get Azusa, the owner of the meat bun store to convey her thanks, the owner of the divination stall to return the apparently massive cheque left to him from the groom as payment, and so on). Miki turned out to be in the area where they all eventually ran to, having convinced the cameraman to do an outside shoot as an attempt to buy more time, and the entire "wedding party" was successfully captured on camera. 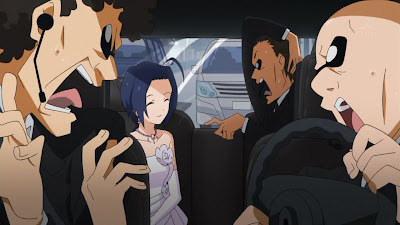 The episode ended with everyone having settled all of their issues (off-camera, due to a short scene jump), and the red-haired bride (that both Makoto and Miki had somehow mistaken for Azusa at various points in the episode) returning the heirloom ring. However, the groom showed up (either his name is "Oil Baron" or he is one), causing the bride's heart to waver at the face of the very good-looking man. She immediately put the ring on and agreed to the marriage (so shallow...). 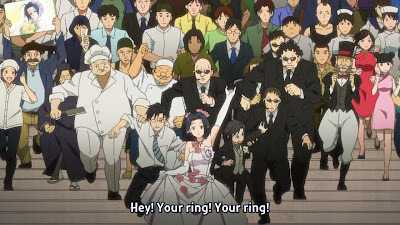 The ED was about Azusa getting married to a man whose face was craftily hidden; I actually fell for it as a glimpse of the "future" until it turned out that it was just Azusa's daydreams. Even though I do like her a lot more (then, let's say, Yayoi), it still amuses me that she cares more about the marriage than her husband. Oh well. At least she doesn't hide it. I would be a little freaked out. All in all, this episode actually ended up surprising me a lot. I had been feeling that the past few episodes had been weak, and this revived my interest in this series. 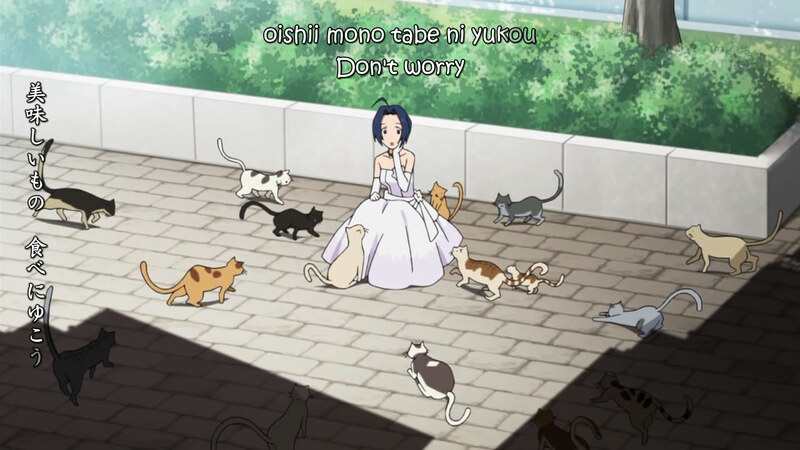 Azusa is a strong character, and I can see how she's good for Ryuuguu Komachi. 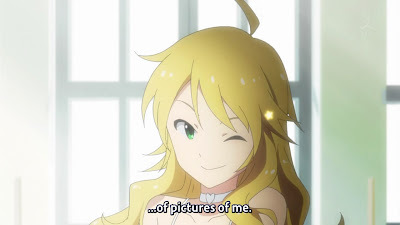 After seeing the various skills of Makoto and Miki, I really hope that they get a break of some kind soon; otherwise, it's almost like their talents are just rotting away. However, I'm sure that they'll have to pretty much work for it themselves; Producer continued to be useless in this episode and my hope for him is just dying more and more.